good morning. this morning I am TIRED. yesterday too--I have not been sleeping well the last few days and i'm feeling it. probably need to take Benadryl for a couple nights to help. did a second glaze firing--kiln should be ready to open in a couple hours. first firing went fairly well--had two pieces I am REALLY happy with. I would say these are the best finished things to come out of my kiln so far. threw some things yesterday--did NOT go well, but I ended up with a few finished pieces. I think I am so tired right now that I just can't relax and concentrate. going to try and catch a nap and see if I can't feel better later. have a great day! Hoping you can get your rest.Love your pitcher and cup, beautiful! They're beautiful! You could try looking into a melatonin regimen to help with sleep. You should see you doctor and have them check to see if you may be low on some vitamins when I was going through what you are going through I was way low on vitamin D. The doctor to me to take 3000 to 5000 units a day I take the 5000 and feel great. 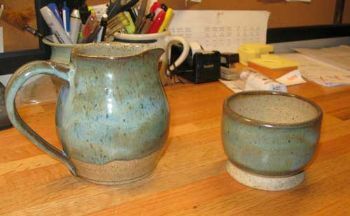 I love the glaze on these pieces!! Hope you get some sleep. It is hard to do anything when you haven't been sleeping well.